Happy Holiday!!!! 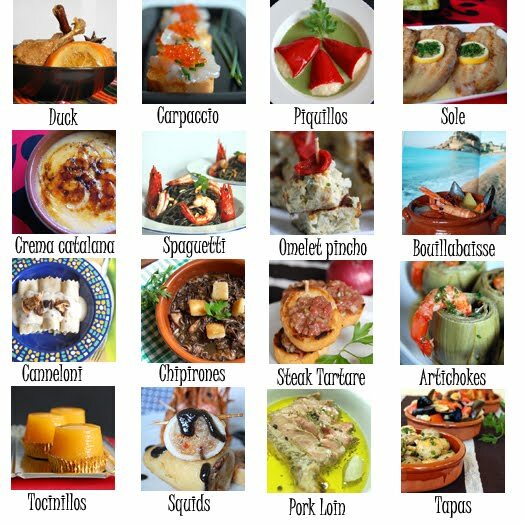 and some ideas for Christmas dishes. Wishing you a happy happy Holiday ☺. I wish you the best for these Xmas days and for the New Year 2010! Bon Nadal! ¡Feliz Navidad! Find hereunder some good ideas for your Xmas Cooking. Duck a la Orange with Spices… Mmmmmm, delicious! Piquillo Peppers stuffed with Cod brandade… Mmmm, can I have another one? Sole Meuniere style… Mmmm, let’s get glamurous and a bit French here! Black Spaguetti dressed in Xmas colours… Mmmmm, a different, yet delicious dish! Omelet’s pinchos… Mmmmm, find dozens of egg inspired recipes. Bouillabaisse… Mmmm, without doubt, one of the best seafood/fish soups! Chipirones en su tinta (little tinny squids)… Mmmmm, a delicatessen! Stuffed Artichokes… Mmmm, sooooo good! Tocinillos de cielo… Mmmmm, Xmas days are the best for these delicious sweet. Stuffed Squids in a black inked sea… Mmmmm, it takes some time but it’s so worth! Tapas… Mmmmm, is it all said about them, or not? Happy holidays to you and best wishes in the upcoming New Year! Nuria…all the best for the holiday season. Feliz Navidad chica! We hope your Christmas is filled with joy, laughter and many kitchen successes in the New Year my friend…you never know what 2010 will bring. Kala Hristougenna Nuria! Merry Christmas Nuria … and a Happy and Healthy New Year! I must try those piquillos! Hope you had a Merry Christmas. Happy New Year. Estimada meva! !una abraçada mooolt especial per a tu, et desitjo el millor per aquest any que comença…smuaksssssss!!!! I have not been abducted by an alien ship! 3 Ingredients, 3 dishes… this is the Royal Joust!